Suspension that comes on MX bikes from the factory these days, as a rule, is fantastic. Take a look at the junk your father grew up on and those vintage bikes guys still race with practically no travel. With a little to no effort you can make today’s suspension work for you right out of the box. Most riders can make do quite nicely simply adjusting the sag properly and fooling with the clickers here and there depending on the conditions they are riding in. Some riders might be required to change to stiffer spring rates to accommodate the spare tire they have acquired through the years to get things just right. Others who are on the other side of the spectrum may have to install softer springs to let the suspension ride at the correct height. Whatever the case, your suspension is essential to your ability to make your way smoothly over an obstacle. Having said this, it is vital to set up your suspension properly from day one, it’s not that difficult. We suggest you shouldn’t simply trust the settings from the factory or the dude you bought the bike from. Experiment with the clickers, trying one circuit at a time at a time to see how it affects the handling. The rule of thumb is, start with the Compression first. As a rule, you should adjust your sag every time you adjust your chain. Incorrect sag is the number one reason for handling issues. If you have already done these things and you are still not pleased with the way your suspension feels. Say for example, you have adjusted the compression damping to a softer setting on the fork and shock and it still feels harsh over high speed bumps? But now you have issues with the fork bottoming! What is the solution? Send your parts off to some suspension shop? It is a viable option. But, unless you want to pay for express shipping, be prepared to be off the bike for a good while. UPS ground is usually 5 days one way plus 5 days back, turn around at a suspension shop is likely to be at least 5 days. Sounds like 3 weeks, possible more to us. There is another option, one that doesn’t require you to intern with a suspension specialist to learn the subtleties of suspension tuning. You can call Race Tech and order their Gold Valve Kit for your fork and shock. The cost for both roughly $340, this may vary depending on the make and model of your bike. If you need springs, look to add an additional $220 for front and rear. Plus you will need 3 quarts of oil at $20 each. You would be spending substantially more than this to have one of the big suspension service companies work on your suspension plus you would have to pay for shipping. The thought of servicing your shock and fork might make you break out in a cold sweat and run screaming from the room like some nelly queen, all those hidden parts. But if you follow the directions in your service manual and the directions Race Tech provides it really is easy. The best thing is you can do your fork in about two hours and your shock in about 1 ½. All you need is a bright work space, a good sized work bench that is very clean – dirt will ruin the inner parts of your suspension, a service manual, we use Clymer, an assortment of metric mechanics tools, a medium sized vise and a few special suspension tools – depending on the model fork you have – all are available through the Race Tech web site. The shock must to be recharged with nitrogen which can be done at the service dept. of your local dealer for about $15. Add to the list the most important ingredient, patience. Any of the services we suggest you do require patience and no distractions the first time through. Keep your work space clean, (did we say this already?) and organized and lay everything down in the order you disassembled it. Any task or service when performed following these simple rules will end in success. We just happened to have a shiny new 2008 CRF450 sitting in the shop with about 10 minutes on it. The CRF is a perfect candidate for this kind of service, since the stock Showa suspension is notorious for feeling harsh. After about 3 seconds of deliberation we decided we should also have the tubes treated with the Carbon Raptor-Hard Carbon coating… since we had the suspension apart. You’ve seen it before, it’s on the factory bikes and Kawasaki ships their 450 with a similar coating. It’s the coating that makes the tubes look black or some other color, Team Pro Circuit uses blue. We had our tubes done by Industrial Hard Carbon in Denver, NC and since they are so close we ran them over so we could have a look around. The Carbon Raptor Process is provided to many of the factory teams including Factory Connection. If it’s good enough for those guys, it’s certainly good enough for EDM. Since they prefer to have new tubes to work with, this was the perfect time to get it done. They can remove your lugs (axle blocks) and apply the hard carbon/DLC to tubes that have been ridden before, they just have to be polished first. The Carbon Raptor Process is applied by Industrial Hard Carbon’s Extremeion Motorsports Division. It is a thin film deposited over the existing chrome on the fork tube/ shock shaft by Plasma Assisted Chemical Vapor Deposition. Essentially the parts go into a vacuum chamber, gases are introduced and turned into plasma which condenses into a solid on the part becoming the coating. It’s a lot more complicated than this but we’re not writing a book and it’s not the sort of thing you will be doing out in your garage. Industrial Hard Carbon performs this service for you. Some of the key benefits to the Carbon coating are: highly wear resistant, resistant to rock dings, chemical additives that corrode your suspension components, it reduces friction that causes excessive stiction and increases life of your suspension components. Learn more by going to the Carbon Raptor website. We dropped off our fork tubes and shock shaft with CJ-Carbon Raptor’s Sales Manager and they were ready for us to pick up the following Tuesday. Once we had the tubes it was time to start sorting out the modified shim stacks, made up of super thin washers, which come with the Race tech Gold Valve kits. When you purchase Gold Valves, Race Tech takes your weight, riding ability and the type of riding you do and calculates a shim stack for you to install. It takes all the brain stress out of the equation, hardly any thinking required! When your Gold Valves arrive, the included paperwork contains an internet access code that you use to identify yourself on the Race Tech website. When you log in you are asked a series of questions about your bike, type of riding, and your “suspension feel” preference. When you click continue you are given a series of letters and numbers that coincide with a table-list that is included with the paper work in the Gold Valve fork kit. This tells you the shim configuration to use. Here’s an example: cH6 which means, compression high speed, option #6. You have options 1-19 in the cH category. Do this same thing for cL-low speed compression, restrictor valving and the gap shim stack and you have your completed shim stack for one fork leg. It really is an amazing system with diagrams that make understanding the process of building a shim stack so much easier than one would imagine. 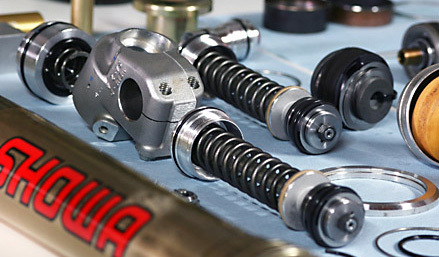 The table also shows you where to go, if after testing you want to make the suspension component stiffer or softer. We disassembled the damping cartridge from our Showa fork and carefully followed the directions from Race Tech. One very important place to slow down and take your time is the removing of the nut at the end of the cartridge shaft. It is peened at the factory. You have to grind or file the end of the threads off the shaft before you can remove the nut. Take your time doing this! Make certain to keep everything clean and organized and if you assemble the cartridge according to the directions from Race Tech you will be surprised how easy it is. 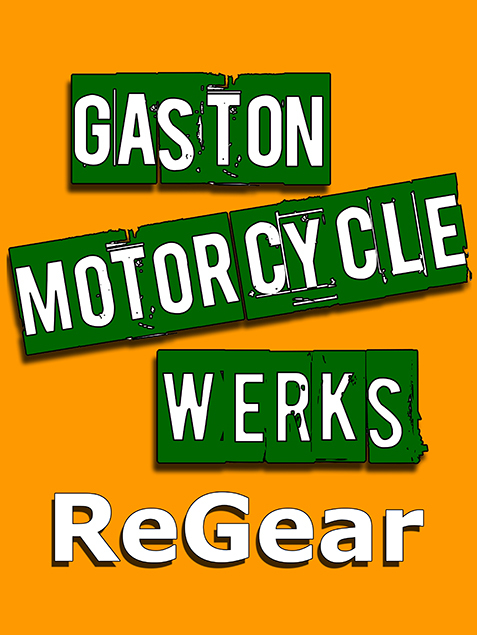 Reassemble the fork according to the service manual and do the next one and move onto the shock. One of the great benefits from going the Gold Valve route is that you gain a better understanding of your suspension system which will help you fine tune it so it performs as you would like it to. I was totally pumped, I was driving to the trick tank practice facility. The big was finally here. I get to throw a leg over our CRF450 suspension project. I was excited because I had not yet ridden the 08 Honda with the 22mm offset, down from last year’s 24mm, plus the steering damper is supposed to make a great difference. Plus, after seeing the suspension come together it got me really excited about how this bike was going to feel. After setting the sag I set out to run in a few laps. The suspension felt buttery smooth. It made stutter bumps more tolerable by transmitting less jarring to the bar which in turn, encouraged me to twist more on the throttle. In high speed corners the wheels felt firmly planted and inspired confidence to ride aggressively. On jump landings the suspension felt plush and didn’t bounce around at all. I tried, as an experiment, to case a small double and found the fork clacking as it bottomed hard. I was not the only one to feel this. So we called Race Tech for some technical support, Brian helped us. He suggested we make a few changes to the shim stack (a very simple procedure BTW) and add fork oil in 5 mm increments. We settled on 10mm more oil and the bottoming issue was gone, the fork still felt very plush and resisted bottoming even when we tried over jumping and landing on the flats. After some minor adjustments to the clickers I found a happy place and was very pleased with the suspension. Was it worth the money? Absolutely, having the ability to fine tune your suspension to your personal preference is as cool as it gets and Race Tech Gold valves combined with the Hard Carbon finish from Extremeion make it as easy as 1-2-3. When getting on the bike, the first thing you notice is the smoothness of the fork action thanks to the Hard Carbon coating. This super slick surface reduces drag and really lets the tubes move smoothly. After spinning a few laps I realized that I did not feel comfortable with the settings given to us for the forks. A quick shim stack change by EDM’s head mechanic and another 10cc’s of fork fluid made the difference for me. On the track the small changes made for big improvements. The suspension worked well when soaking up small braking bumps. Medium sized and fast speed hits all were handled well with a positive, predictable feel from our new suspenders. Confidence inspiring best sums up the bottoming resistance. After purposely over-jumping a few table tops and doubles at the test track, I came away pleasantly surprised that even when using the full amount of travel, there was no harsh metal clunk. A progressive feel to the forks coupled with the shock that gives a planted feeling really makes the bike ride far better than stock. Setup is one huge variable based on a riders ability and preference. Race Tech will get you close, but further fine tuning on your own with compression\ rebound clickers will really dial in the suspension. Firstly, what I didn’t enjoy about the stock CRF suspension were the forks in particular, they were relatively stiff in the initial stroke, the bottoming resistance felt good (probably due to initial stiffness) but overall it felt as though it was setup for a very wide open sweeping pasture. 🙂 I struggled to turn the bike without raising the forks 15mm above the top clamps which in turn sacrificed stability. The shock on CRF was good, it had a nice progressive feel through the stroke and I felt like it was a good match to my weight and ability. Once the work had been completed I was itching to see what difference it had made, on the first ride the forks were considerably plusher than the stock suspension throughout the stroke and actually tended to bottom a little bit too easily with a nasty metal on metal clank. After some tinkering with the oil level height (added an additional 10mm) it made a substantial difference. The oil level height gave the fork additional bottoming resistance but seemed to sacrifice a little bit of plushness in the mid stroke. Once we had the oil level height sorted out we started to get the rebound and compression settings figured out. We slowed down the rebound and compression and the forks had a great feel to them. Since the shock felt pretty good from the get go, a few rebound changes slowed it down slightly which gave it a more responsive feel. At the end of our test/setup session I felt it gave the bike a more nimble feeling with the ability to turn easier. Under hard breaking the front and rear suspension felt controlled and didn’t step out of line. Once we had the rebound issues worked out of the rear shock the bike felt stable and smooth over jumps. The bike sat through small choppy sections on our test track and maintained traction which was a good improvement over the stock setup. Overall I was happy with the Race Tech valving and Carbon Raptor coating from Extremeion.